The 2017 Flat Season takes off at Ascot racecourse in May, and with it a delectable menu of fine wine and cuisine is on show for visitors. 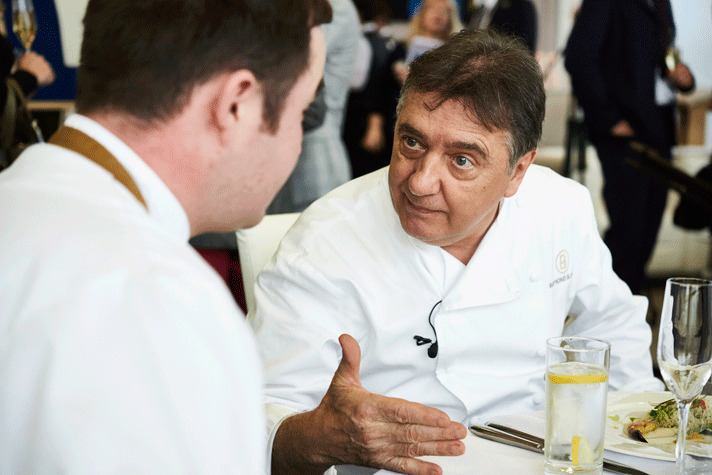 UK-based chefs Raymond Blanc OBE, Phil Howard of Elystan Street, and Sam Williams, executive chef of Angela Hartnett’s Café Murano, will all be serving gourmet dishes at the iconic British horse racing event this year. At the racecourse, fine dining has to compete with the thrill of horse racing. It’s important to coordinate timings with the big races of the day, and respond quickly should there be any changes or demands from the dining room. A smaller, unfamiliar kitchen, different equipment, and a new team, are all factors the chefs address, however these hurdles can be overcome with simple yet aesthetically pleasing dishes, and naturally, meticulous planning. “There is a huge logistical element,” explains Raymond Blanc, “We have less time to train the kitchen and front of house teams but, regardless of these challenges, we always manage to provide the very best experience: a real feast to fit the occasion.” Used to having his own space and kitchen garden at Belmond Le Manoir aux Quat'Saisons, Blanc overcomes this obstacle by sourcing local produce. For a traditional British event, provenance is extremely important, so much so, that the lamb served by Blanc during his residency in the Panoramic restaurant comes from The Royal Estate at Windsor, the crab from Cornwall, and strawberries from local farms surrounding Ascot. Indeed, the chefs use the seasonal produce to inspire and drive their menus. Thankfully, June proves to be a generous time for providing ripe fruits and vegetables. Phil Howard also values provenance and sources as much produce as possible from the region, stating that certainly nothing would be imported. “The dishes must be visually stunning with a heavyweight, classic, British feel. They must also be practical as the service is unrelenting and fast,” said Howard. In turn, the classic wine list matches seamlessly, and contributes to the traditional, iconic, affair. Blanc personally curated the wine pairings for his menu at the Panoramic, opting for an English version of Sauvignon Blanc in the form of Bolney Estate Bacchus, letting its zesty, refreshing and delicate aromas of jasmine pair impeccably with the crumbly, sweet, Cornish crab. A Côte de Beaune Villages Roches Blanches Pinot Noir from Domaine de Valliere Roux pairs beautifully with the new season lamb with its light, fruity flavors, while an organic Rosé from Château Léoube is a crowd-pleasing alternative that pairs with any of Blanc’s dishes with its fruity aromas and dry, crisp, finish. As the first and only official Champagne of Royal Ascot, Bollinger will be interwoven throughout the Royal Meeting and Ascot race days, where the Special Cuvée will be flowing at a number of bars in the Grandstand and the Royal Enclosure Gardens. Budding chefs should take note that 2017 marks the inauguration of the Ascot Racecourse Chef Scholarship Programme. The first recipient, Matthew Shipley, a chef from the racecourse’s in-house culinary team will be mentored by Raymond Blanc throughout 2017, and is anticipated to receive an endorsement from Blanc following the 12-month scholarship program. In addition, Blanc will take part in the Ascot Service Academy for the second consecutive year, working with front of house managers to deliver flawless service. The preparation includes hands-on training at the two Michelin-starred Belmond Le Manoir aux Quat’Saisons. Amidst the various challenges involved with working in a new cooking environment; fine wine and gourmet dining play a huge role in the spectacle of the historical, high-class sporting event.